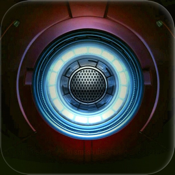 Have your own iron man suit reactor! Ever watched iron man and saw the cool iron reactor on the chest of tony stark? Now you can have your own! Adjust the action (pulsing/rotation) of the reactor with the Rotate and heartbeatmode buttons, choose your favorite color then tap the center of the reactor to hide the controls. Now place the phone under your shirt or tee. If you want to totally get into the mode use the repulsor button for some sound action. Iron Reactor can also be used as a flash light. Simply tap the flash light button to engage your iPhone's or iPod's flash light. Best used in a dark room!